The hygiene and durability of bathroom floors is important as it serves as a host to makeup marks, potty spills, wet feet and splashed water. This does not however mean we compromise on style to maintain the required qualities in our bathrooms. The following floor designs provide very Eco-friendly choices on the floor type. Concrete is known majorly for its multi tasking tasking role in the creation of structures. Its cost effective, smart and efficient to simplify a complex floor to a single material. Greening our concrete floors can be by means of recycled aggregates including porcelain, glass or coal fly ash. The feel of a smooth stone under our foot when we get into our bathrooms coupled with a gently massage brings relief and makes our shower moments memorable. Pebbles are mainly mined but Modwalls folks have come up with a version of pebble tiles by the name of ModRocks, created entirely from recycled glass. They are harmless to the environment and at the same time lending the spa vibe. 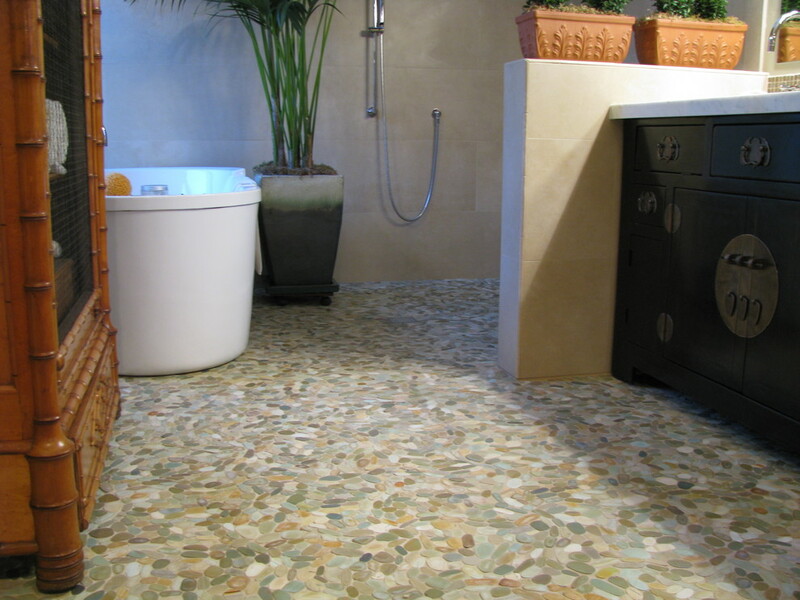 Terrazzo are common for their durability and great looks. They always seem indestructible and are made of polished granite in a concrete or marble chips. With regard to sustainability they score highly depending on the type of sealer coupled with low impact aggregates. Although it has very little in common with sheet vinyl, the two are always confused. The antimicrobial factor and the linseed oil are a major representative of true linoleum. To add to its unique qualities, linoleum is fire, water and scratch resistant and it also strengthens over time. Linoleum happens to be available in tile, plank and sheet form. Based on its colour options and jewel like qualities, they recycled glass make the greening bath a breeze. Almost all the Oceanside glass tiles products consists about 30% to 97% of recycled content. Ceramic waste from tableware pieces and discarded clay are the materials components recycled to create the one of Ann sacks Savoy series. This particular refined savoy series comes at a fairly cheap price and in a broad nature plying us with all the mosaics and field tiles needed in a bathroom. Probably the most Eco-friendly as it's mainly gotten from its two main producers, Spain and Portugal, both in which it's harvested every 9 years to make the bulletin boards and flooring tiles. Every bit of the cork tree harvested is put into use. Its harvesting mainly involves the careful peeling of the thin bark into wide slabs. Architects and designers have eschewed the notion of wood floors not belonging to bathrooms. Regardless of this wood is still a part of many bathroom floors in various houses. When properly fixed and well taken care of wood floors rarely present challenges. Ecologically wood can be the worst or best material. It can sometimes be perfect based on how it’s harvested. Wood has a long life cycle and is durable as well. Wood not harvested in a sustainable manner however tend to be ecologically destructive. In choosing wood floors the following a proper guide for a well sustainable choice.